Proper academic education is the birth right of every individual. But not all families have the financial capability to support their children’s academic dreams. In India, minority communities often fall under poverty line. Lack of money forces parents to discontinue their kids’ schooling. But central government has always tried to support such families with financial assistance, so that these children can continue their education. 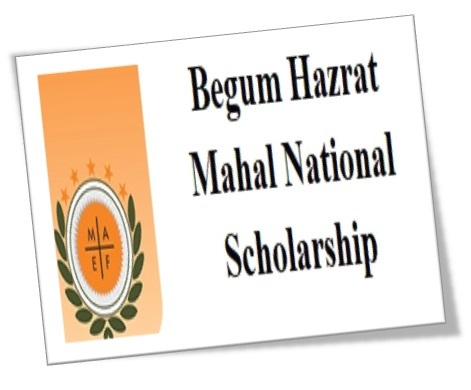 One such project for minority development was Begum Hazrat Mahal National Scholarship. The official portal of this scheme has been activated. All interested and eligible female students can log on to the site and complete their registration for 2018 – 2019 academic year. Objective of the scheme – The main objective of this central government scheme is not only to support minority female students in their quest for education, but also offer respite from financial worries. Grant utilization scope – The financial grant that selected applicants will receive from the central government must be used to pay tuition fee for school or college. It can be used for purchasing academic supplies and books. This money can be used to pay for food and lodging rents. Financial assistance – Female candidates that are studying in 9th and 10th standard will receive a maximum grant of Rs. 10000. Students who have been promoted to 11th and 12th standard will receive a maximum of Rs. 12,000 as scheme grant. Selected minority communities – Only six minority communities have been identified for this scheme benefits. These are Christians, Muslims, Buddhists, Sikhs, Parsis and Jains. Grant payment pattern – All selected applicants will receive the respective amounts in two equal installments. Installment amount for 9th and 10th standard applicants will be Rs. 5000 and that of 11th and 12th standard candidates will be Rs. 6000. Number of scholarship holders – The number of scholarship holders will depend on the percentage of minority applicants in each state and union territory. Selection preference – Preference will be given to those students who come from financially weaker backgrounds. Candidates whose parents earn less will be selected first. BPL families will get preference under this educational grant project. Payment mode – All payments will be done via bank. The central government will transfer the money in the selected applicant’s respective bank account. Minority female students only – It has been mentioned in the scheme that only female students, belonging to identified minority groups will be allowed to get this financial assistance from the central government. Marks related criterion – It has been mentioned that applicant must have scored at least 50% in the last examination. Income related criterion – Only those candidates will be allowed to get enroll under this scheme whose parents do not earn more than Rs. 2 lakh on a yearly basis. Single applicant for each candidate – It has been mentioned that each suitable applicant can only fill in one application form. In case any girl registers more than once, she will be rejected completely. Not for abroad studies – Only candidates who are willing to stay in India and study will receive this scholarship. In case the candidate is interested in going to another country for academic purposes, she will not be selected. No other scholarship – In any applicant is already getting another educational scholarship, sponsored by either the state or central governments, then she will not be able to get financial assistance under this scheme. Minority certificate – It is mandatory for applicants to attach a self-attested certificate. This certificate must highlight the minority religion of the applicant. Income certificate – All applicants must furnish a properly issued income certificate of their parents. The certificate must highlight the annual income of the guardians. Aadhar card of applicants – An applicant must attach a clear photocopy of her Aadhar card with the printed application form. School/college certificate – The verification form of the school or college, duly signed by the principal has to be attached with the registration application. Mark sheet – The candidate must attach a photocopy of her mark sheet with the print out of the registration form. This mark sheet needs to be attested by the applicant herself. Attested applicant’s photograph – The principal of current school or college needs to sign and attest a recently taken photograph of the applicant. Bank passbook photocopy – As the money will be transferred in the bank account of eligible candidates, they need to furnish bank account details. For this, candidates must attach a photocopy of the first page of their account passbook. All female applicants, interested in applying for this scheme have to log on to the official website to enroll. The entire application process will be done via the scheme’s portal. To get access to the digitized registration form, applicants have to click on https://scholarship-maef.org/. The online application lines have been activated so that interested candidates can enroll as soon as possible. Interested candidates have to click on the authorized link of the grant scheme, i.e., https://scholarship-maef.org/. When applicants click on the first option, the registration procedure will be triggered. A new page will open in a separate window. It will contain general instructions, which will assist applicants during registration. Clicking this button triggers another page, where applicants need to type in their personal details like domicile, full name, parents’ names, birth date, religion, total marks scored in examination and others. After finishing the personal page, applicants need to click on the button marked as “Next.” It will open the next enrollment form page. Here, candidates must type in their address and contact details. Then they have to click on “Next” to fill in all information related to occupation of parents or guardians and bank account details of applicants. The last section of the online enrollment form requires candidates to provide their academic details. They need to highlight the name, address and contact details of their schools. At the bottom of the page, they will find a small box alongside the words “I accept T&C.” candidates need to click in this box. It is possible to recheck other details by reviewing previous enrollment forms. For this, one has to click on the button marked as “Prev” meaning previous. Clicking on this button will allow a candidate to get back to the last page. It will complete the registration and online form submission process. It is possible to check the status of the application. All applicants must log on to the official website of the scheme. Eligible female candidates have to click on the link https://scholarship-maef.org/. As the home page opens, candidates will see five tabs at the top of the page. The third tab from the left is marked as “Status.” If an applicant is interested in checking her enrollment status, she needs to click on this tab. It will open a new page. One can also get to the page directly by clicking on the link https://scholarship-maef.org/searchAppStatus. On the status page, applicants need to type in their scholarship category, identification details and birth date. Each applicant needs to click on the drop down arrows and select appropriate options for scholarship category and identification detail options. It will trigger the site to check its database. Then it will highlight the updated status of applications. After the online registration process is complete, applicants need to get a print out of the enrollment documents. The print out has to be attached with necessary documents and submitted at the office of Maulana Azad Education Foundation. Gap in academic year – If the applicant fails to get promoted from one class to another, or takes a gap in academic session, then she will no longer receive the scholarship money. Failure to reapply – If an applicant fails to renew the application in time, then her name will be removed from the beneficiary list. Failure to meet time limit – If any applicant fails to submit the online and offline registration form, along with necessary documents within the deadline, then she will fail to receive this monetary grant. Furnishing false details – If the authority finds out that any applicant has deceived it with incorrect data, then she will not only be barred from receiving the money hence forth, but will have to repay the amount she received previously, under this scheme. It will be the duty of state or UT government to recover this money. If the monetary grant is discontinued by the authority due to any reason, then that applicant will not be able to reapply for this scholarship anymore. In case the foundation deems necessary, it can bring about changes in the scheme guidelines. It has the power to do so. If existing rules are altered, the foundation will highlight them on the official site. Each year, more and more applicants are enrolling under this scheme. It is a prominent indicator of the scheme’s success. With financial grants like this, minority and financially weak candidates will be able to continue their education with ease. In an announcement, made by the Minority Welfare Ministry, it was declared that the central government will offer 15% more financial assistance to minority girls, who are studying in schools. Girls, studying in 9th and 10th standard received Rs. 5000, while pupils of 11th and 12th standard received Rs. 6000 on an annual basis. It was also said that to offer more financial grant for these students, around 90 crore will be allocated to MAEF for implementation under ‘Begum Hazrat Mahal National Scholarship Scheme.’ It will encourage parents as well as minority girls to go to school on a regular basis. please tell me how to renew the scholarship?